The organisation that governs global cellular standards, the 3GPP, has ratified the first finalised specification for 5G. Fierce Wireless reported on the sign off yesterday, at the Radio Access Network (RAN) meeting #78 in Lisbon, Portugal. With the first signed off specs now ready for 5G, vendors can start building 5G capable equipment, which will be guaranteed to make use of the next generation cellular communications standard. In line with expectations, the finished 5G specification covers a wide range of the radio spectrum “from below 1GHz, like 600 and 700MHz, all the way up to around 50GHz, and include the 3.5GHz band,” reports the source. What has been ratified so far is the Non-Standalone (NSA) 5G New Radio (NR) specification for 5G products. Meanwhile, the Standalone (SA) version is due for completion in June 2018, defining the full user and control plane capability for 5G NR. It is the SA version that will form the replacement for 4G LTE which is commonly used by smart devices today. Please note that the NSA and SA versions share physical radio air interface aspects. Earlier in the week, in a hint at the impending ratification, telecoms giant AT&T told Fierce Wireless that “we believe we’re at a point where silicon manufacturers can begin their designs and start developing silicon”. A few technical implementation issues remain on the drawing table but they are expected to be ironed out in early 2018 and won’t have an impact on the spec itself. 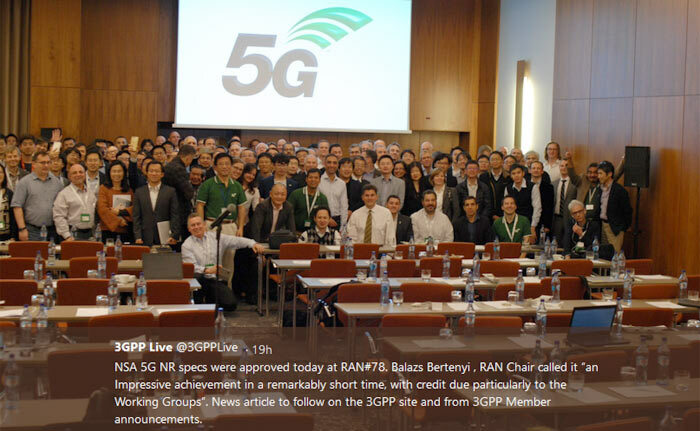 Another report on the RAN #78 meeting, by ZDNet, lists a host of companies who will now start full-scale development of 5G NR including large-scale trials and commercial deployment. The companies include; Huawei, Ericsson, Intel, Nokia, Samsung, AT&T, BT, China Mobile, China Telecom, China Unicom, Deutsche Telekom, Fujitsu, KT Corporation, LG Electronics, LG Uplus, MediaTek, NEC Corporation, NTT DoCoMo, Orange, Qualcomm, SK Telecom, Sony Mobile Communications, Sprint, TIM, Telefonica, Telia Company, T-Mobile USA, Verizon, Vodafone, and ZTE. Widespread commercial deployment is expected to start next year. Any news on realistic expected speeds?